Factory assembled and tested System Controller Assemblies are NEC Compliant, designed for use with a separate custom control panel, or touchscreen computer that communicates via RS-485. See the Operator Interface section for available options. 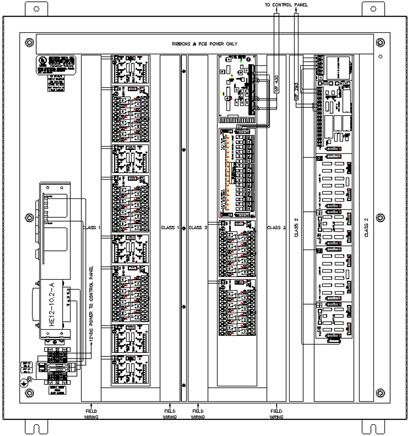 An HC-0682 System Controller master (or slave) can communicate via two RS-485 channels with up to fourteen HC-0682 slave modules and / or HC-0701 Remote Panel Controllers. and a host PC. The HC-0714 provides a communications interface for thirty-two inputs into the HC-0682 System Controller. The HC-0715 provides a communications interface for thirty-two outputs from the HC-0682 System Controller. The HC-0851 provides a communications interface for FORTY-EIGHT OPTO-ISOLATED inputs into the HC-0682 System Controller. The HC-0821 is a programmable logic microcontroller Any I/O logic functions your project requires can be performed by this unit. Four dip switches and four LEDs are fully programmable, along with all of the input and output points. A separate green module status LED is also provided. Typical uses: Alarms, "Flashing Travel", location annunication, etc. The HC-0850 provides a communications interface for FORTY-EIGHT OPTO-ISOLATED outputs from the HC-682 System ControllerThis HC-0832 connector adapts the supplied connectors from an Omron C200 Series DC Input Module, to a 34 conductor ribbon connector, with a common 24VDC ground connection at both the top and the bottom. Each HC-0832 Input Module Adapter converts thirty-two input points. Two are required for each sixty-four point input module.